"When it comes to blood, you can either spill it...or save it. 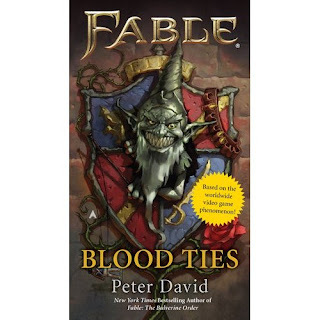 Based on the worldwide video game phenomenon, this novel from the New York Times bestselling author includes a code to redeem for FABLE III Dye Pack. When they write down the histories of Albion, the name of Ben Finn will be remembered in honor. But at present, I'm feeling a bit of wanderlust-and I'm on the move again. I had to leave the beautiful Page behind, unfortunately. So, instead of a brave woman at my side, I've acquired a troublesome toadstool of a gnome who will neither leave me alone nor shut his insolent mouth. Not that verbal barbs can hurt me-they're nothing compared to the foe that is assaulting the walled city of Blackholm. A mysterious warlord has been slowly devouring the surrounding lands, and Blackholm is putting up a fight. What better place for a drifting warrior to make his way and earn his pay? But a darkness that no mortal can withstand is about to be unleashed. And it holds a secret that is bound with my very blood..."
Not too bad eh? Will have to keep an eye on it that's for sure!